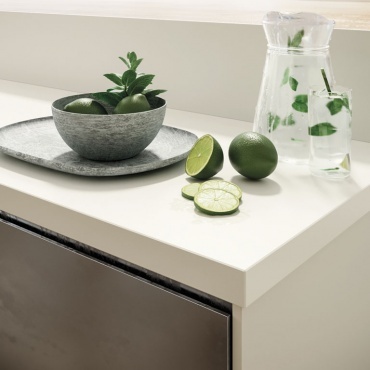 Absolute white for worktops represents the ideal choice for modern, elegant interiors. This is a versatile product that can be paired easily with other materials and effects, for unlimited freedom of expression and design. Absolute White porcelain stoneware slabs for indoor and outdoor spaces. The slabs come in a 162x324 cm size with a thickness of 12 mm and are available in a silk finish. Ideal for outdoor and indoor kitchens, tables for the home or for meeting rooms, for furnishing any space in domestic or commercial settings and for ventilated façades. Absolute White Habitat: Absolute White silk slabs by Atlas Plan are paired with Arbor Natural for floors. The ceramic slabs are proposed together with decorative materials and fabrics that create a fresh, convivial space.